Taking a side path for a bit of time to concentrate on craft items for an outdoor show, my Deva painting series got put on hold for a bit. 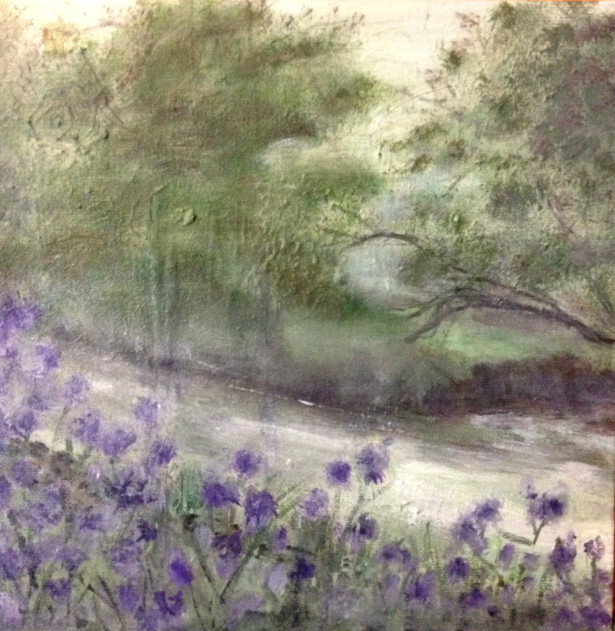 The Fairy Iris Deva sat patiently on my easel for weeks, just starting to emerge on the canvas. Meanwhile, the aftermath of serious crafting production, left my studio in utter chaos. I closed the door for a while, with the need to take a break. I took up a library book – Claude and Camille by Stephanie Cowell – a historical novel of Monet. The story is of a young Monet, his first years in Paris along with his companions at the beginning of the Impressionist movement–Renoir, Pissarro, Bazille, Manet and Cezanne. As I got caught up with the novel, I felt that it began to fire up the artist within me. From my own studio came the call of the unfinished canvas. Digging in first to clear the energy of chaos in the studio, I set to work cleaning up and organizing. I brought in my drum to change the vibration to a higher state and clear out the old stale (and rather stuck) energy. The window was flung open to let in sunshine and fresh air. Laying out my paints and brushes, I was ready to go. The more I worked, the more I got lost in the painting. The fever pitch set in, causing me to lose all sense of time until my cell phone twitched with a text message. I realized it was 6:00 pm already and I was very hungry! I actually love it when this happens, being consumed by a painting. Ultimately you realize that you are over tired and better stop to avoid any big mistakes. It was close to mid-night. She sits now – at rest, having fully emerged. It’s at the stage where I “live with” a painting for a while – essentially finished, but sitting observed on the easel in case a need for tweaking becomes evident. Two more Devas waiting in the wings will complete the series. There is energy in these paintings that I can not explain. 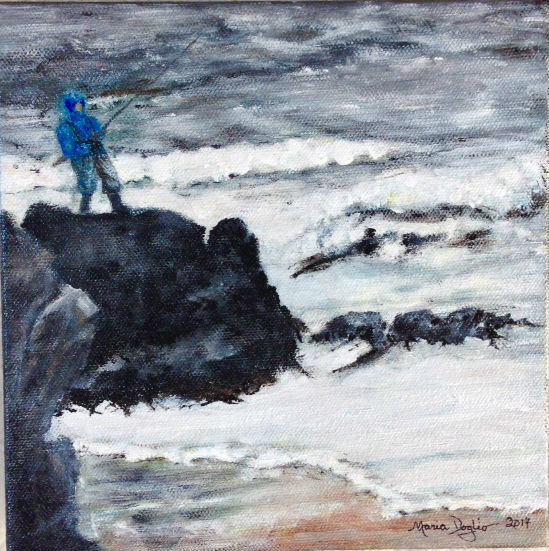 It is a journey, not only in the painting, but also, I believe, in connecting with the energy that comes from the force of nature personified. The authors of Findhorn and Parelandra books talk of their cooperative work in the gardens with the over-lighting Devas and Nature Spirits. As the Deva emerges in each painting, I will continue to share my personal journey in painting them with you until all are complete. Be inspired to step out of the box with your art – what shows up may surprise you! 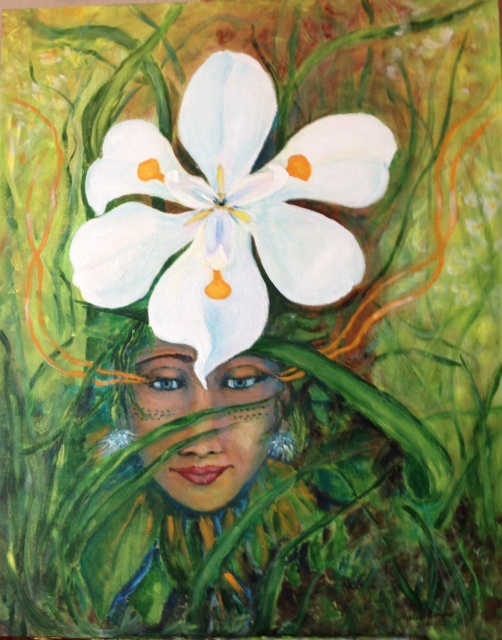 Ref: Bird of Paradise Deva July 13, 2014 Blog for first painting in this series. I left the house askew, needing dusting, the floors unswept, sewing and art projects scattered in almost every room unfinished or poised with ideas waiting to blossom into form from my imagination. The sky outside was threatening, but I wanted to walk. I took the umbrella, just in case, setting off for the local coffee shop, dropping letters into a mail box along the way. I headed past the now famous and controversial “Listener”, a giant naked green lady, her gaze serenely intent on the heavens. She is oblivious to her nakedness and all that find her “distasteful” – she is herself, a unique expression of life’s essence and the artist who created her. I decide to sit at a table outside under a red umbrella. It occurs to me that the color red is showing up a lot in my life lately. The boldness of red. Courage. Fearlessly moving forward. All of these is the subtle message being given to me within the color red. Just what I need now on my journey to embody more fully, the integration of art in my life! I sit sipping latte from a yellow cup and saucer, observing colors all around me. The gray tones of early morning are now gone. The artfulness of this little bit of town is now set against a sky that has gone fluffy with giant clouds, with patches of brilliant blue sky emerging from behind them. We take our inspiration for art from life all around us. The outward vision fuels the inner vision and from there springs our interpretation of the worlds that we find. Colors in nature play in our vision to spill upon the canvas. Like the “Listener” who asks us to stop and really hear beyond ourselves, colors present themselves, both subtle and bold, so that we may see and feel more clearly the riches around us. Whatever art form I am drawn to, whatever colors are calling me, the feeling of the colors in the portrayal is just as important as the image itself. 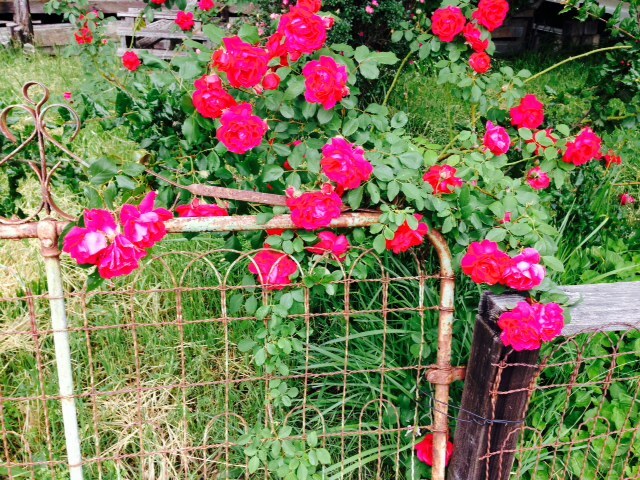 On the walk home, I found beauty of colors in a tangle of weeds and at an old gate to an abandoned house. After I paint them onto canvases waiting in the wings, these images will continue to tell their story, long after the blossoms have faded. Take your inner artist for a walk, keeping an open mind for the unexpected beauty and simplicity in the vignette’s of nature. See what colors you come home with to inspire you. 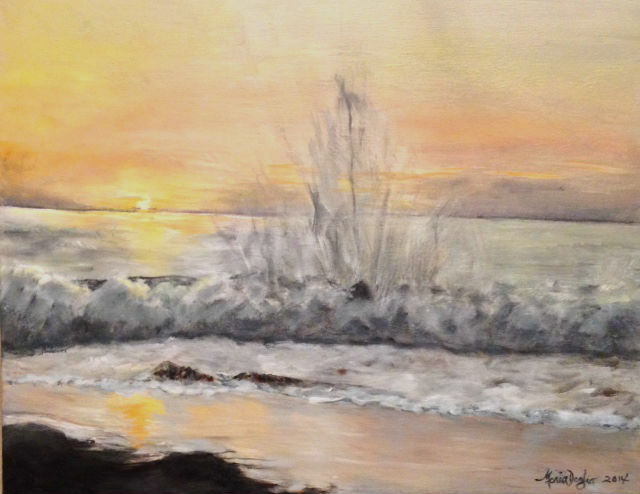 The day I decided to try to paint without judgement, without comparisons to other artists, silencing the harsh ridicule of the inner critic, was the day I crawled out from under a painting block that lasted 24 years. 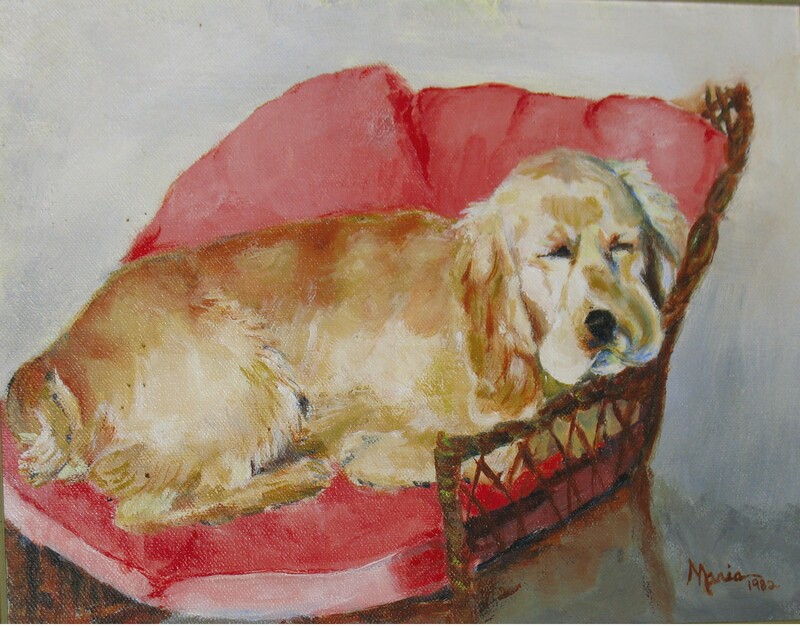 I was living in Sedona, AZ, in 2006, surrounded by the most amazingly creative art that I had ever seen, and happened one day, to notice the date of my last painting–one of our dogs– Logan, 1982. I did other creative things during that time period – stencil design, craft work, and photography, but the canvas continued to allude me. In Sedona, I began to frequent the many galleries. The energy and creativity of other artists began to penetrate and crack the shell I had built up surrounding painting. Inspired, I began to think I might start painting again. 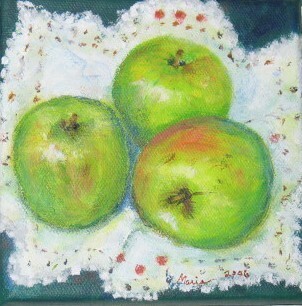 At the urging of a friend, I experimented with a small painting of apples. What followed was a surprising surge of creativity. I started painting, reinstating my passion, discovering new areas of creativity and haven’t stopped since. I began to understand that my art was my creative expression unique to me – not everyone has to like it. If I achieve in my art what my inner vision wants to express, my art piece is successful. It is a piece of me that I am sharing with the world. That is enough, no judgement necessary. The inner critic is always there, lurking for an opportunity to be heard the moment you get a little bit discouraged. Sometimes I have to do the work to subdue it again. That is when I walk away from a painting and let it rest on the easel in contemplation. I can then intuitively plug into the painting–it tells me when I am ready to return to it, then it reveals how it would like to emerge into completion. Go within and listen to your muse. Unblocking Tools: One of the biggest influences in recovering my sense of identity as an artist, was Julia Cameron’s The Artist’s Way – A Spiritual Path to Higher Creativity. Her course ignited a journey that is on-going and I return to it for inspiration during periods of artistic down time. Her course helped me think outside the box and to just let go. The exercise of “morning pages” – a brain drain, stream of consciousness – is the most amazing and surprising tool to unlock blocks. Julia describes the morning pages as “the primary tool of creative recovery”. Writing allows you to get all the negativity out, facilitating the letting go process. It may seem like an erratic process at first. Keep at it and trust. The Artist’s Way helps you to uncover your real self, restore confidence and free your intuitive creativity. My current leap in creativity is developing this website and in writing this blog –ten years ago I wouldn’t have had the courage. It reflects back to me where I have been and where I might be going, By sharing my journey, I hope all who read this are inspired within their own journeys. Over time, I have recovered my sense of strength, connection to my inner muse and most of all, my sense of possibility. My artistic journey continues to grow in new ways- taking me on unexpected curves in the path. My creative blocks, if they happen, don’t last very long. The nature of life is, in itself, creative and never a straight line. 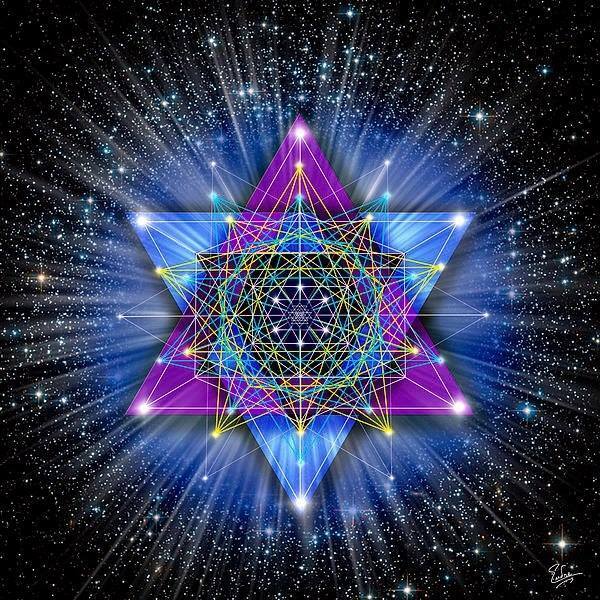 We flow on waves of connected quantum energy. How you utilize that energy is a choice. How you let that energy affect you is a choice. 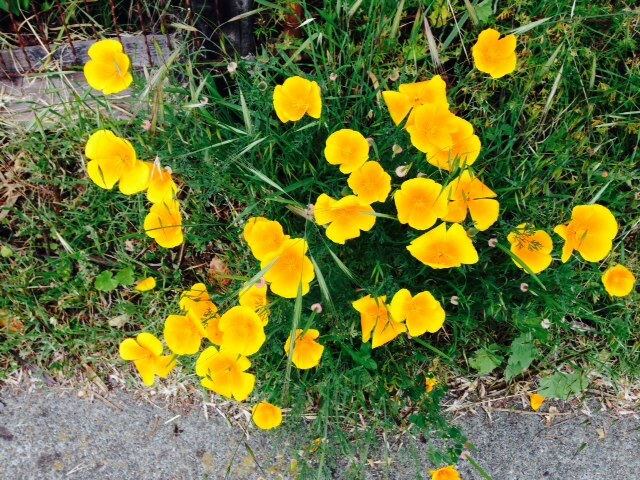 Each day gives us the opportunity to create anew, to express our authentic self, be inspired, and keep growing. Keep an open mind to creativity and it will lead you to higher goals; once reached, set new ones. You will soon discover that creative imagination is limitless.